1 of 3 Heat oven to 350 degrees F. Coat a shallow 1 1/2-quart baking dish with nonstick cooking spray. 2 of 3 Melt butter in a medium saucepan over medium heat. Add flour and whisk until smooth. Whisk in milk, salt, pepper, nutmeg and cayenne. Bring to a simmer; cook, simmering, 3 minutes. Remove from heat and whisk in Swiss cheese and cream cheese until smooth. 3 of 3 Combine artichoke hearts, spinach and garlic in a food processor and process until evenly blended and chopped. Fold into cheese sauce and pour into prepared dish. 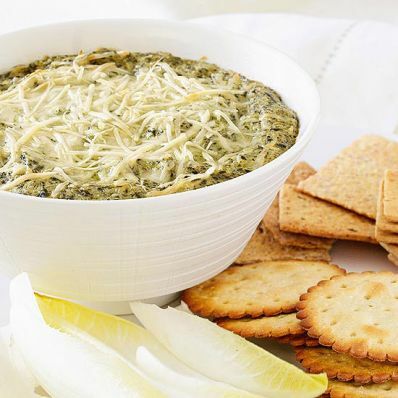 Spread smooth and top with grated Asiago or Parmesan. Bake at 350 degrees F for 30 minutes, or until bubbly around edges. Serve warm with endive and crackers for scooping. Per Serving: 12 g carb., 8 g Fat, total, 24 mg chol., 5 g sat. fat, 4 g fiber, 560 mg sodium, 148 kcal cal., 8 g pro.